3. Very Few O Rings making cleaning extremely easy. 2. Only a 12 inch stock barrel that performs “okay”. 3. Regulator hose line moves too easily. The Azodin Blitz EVO Review. It’s always a win for the consumers when companies listen to their users and make requested changes. For the 3 year old company Azodin, their story is no different. The Blitz is back and better than ever, and still at the same price point players on a budget love. The Blitz EVO carries great upgrades from its former self, like a new on/off asa and redesigned trigger, and is a great starter gun for any wood sball, tournament, or rec ball player. Of course, you do get what you pay for, so the EVO isn’t without flaws, though they are small in comparison to other guns in this price range. Price: $199.99 Specs: Trigger: The AZ sling trigger is a new design made specifically for the new EVO. Instead of the original curved rocking trigger, the sling is a more traditional electric marker shape, commonly known as the “s” curved trigger. 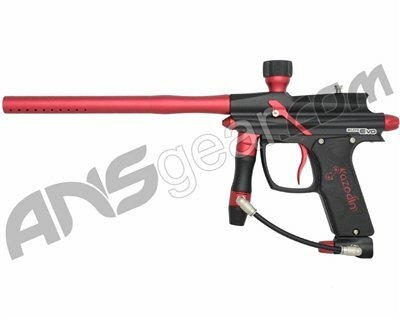 ASA: One of the most obvious changes to the new EVO is the introduction of Azodin’s first on/off ASA. A simple twist of the knob airs up the marker and is ready to go on the field. Regulator: The Rock Steady regulator now includes the newly introduced MASS FLOW valve, to help with increased efficiency. A much needed upgrade from the former Blitz. Board: The third generation of the Zen Board has fixed a few glitches that its predecessors have been known to have. It’s LED lights are noticeable enough to see how to change settings, tech, tune, or notice the warning given for an issue with the eye system. The Good: The Blitz EVO’S most obvious benefit is the price point. 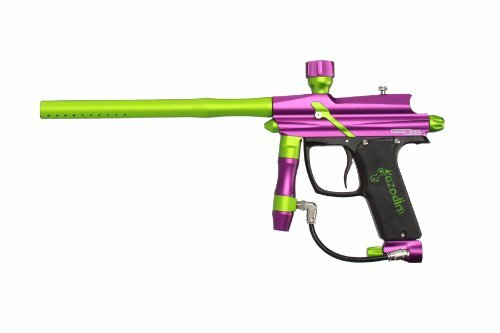 For under $200, you receive a marker that is more than ready out of the box to be used in the woods, or even on the fast adrenaline paced speed ball course. The on/off asa is something that is hard to come by on any gun under $400, and helps both on and off the field. Without a doubt though, the o-ring less feather striker hammer makes cleaning and maintenance a breeze for any player, giving newer or younger players a sense of comfort when taking apart their gun by themselves. The Bad: While the EVO is a great starter gun, you will soon find yourself feeling like something is missing overtime. Though the new trigger is a nice feel, it tends to feel like it is loose and sometimes even feels like there is nothing there. With a one piece 12 inch barrel, you will soon find that distance, accuracy, and proper bore to paint sizing becomes an issue when beginning to play more competitively. and while they do include a macro line swivel to turn your air hose, you will find that you must either have it tightened all the way and not movable, or have it so lose it turns with a flick of a finger. Thankfully, keeping the macro line aligned straight with the gun typically is the best position for most players. Overall, the Azodin Blitz EVO is possibly one of the best marker options for its price points. It’s flaws are typically found throughout all guns in this price range, and yet the EVO still finds additional features even some high end guns don’t think to add. So if you’re looking for you or your child’s first gun, or perhaps even need a decent backup gun when in a pinch, don’t be afraid to give the EVO a serious consideration. For the price, features, and flaws compared to its same price competition, it receives a solid 3 out of 5.